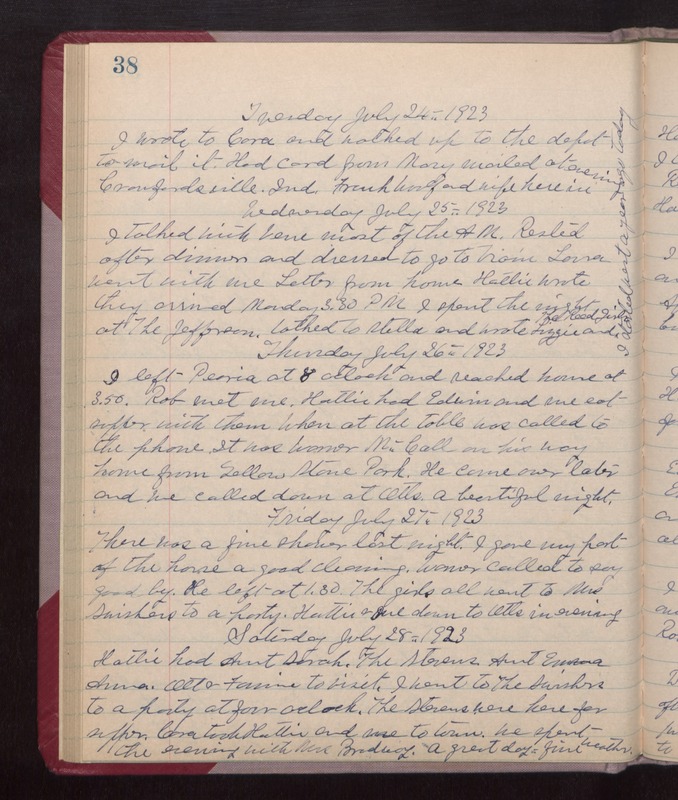 Tuesday July 24th 1923 I wrote to Cora and walked up to the depot to mail it. Had card from Mary mailed at Crawfordville, Ind. Frank Woolf and wife here in evening. Wednesday July 25th 1923 I talked with Vene most of the AM. Rested after dinner and dressed to go to train. Laura went with me. Letter from home. Hattie wrote they arrived Monday at 3:30 PM. I spent the night at The Jefferson. Talked to Stella and wrote Lizzie and the Reed girls. I started west a year ago today. Thursday July 26th 1923 I left Peoria at 8 oclock and reached home at 3.50. Rob met me. Hattie had Edwin and me eat supper with them. When at the table was called to the phone. It was Warner McCall on his way home from Yellow Stone Parl. he came over later and we called down at Otts. a beautiful night. Friday July 27th 1923 There was a fine shower last night. I gave my part of the house a good cleaning. Warner called to say good-by. He left at 1.30. The girls all went to Mrs Swishers to a party. Hattie & me down to Otts in evening. Saturday July 28th 1923 Hattie had Aunt Sarah, the Stevens, Aunt Emma, Annam Ott & Fannie to visit. I went to The Swishers to a party at four oclock. The Stevens were here for supper, Cora took Hattie and me to town. We spent the evening with Mrs Broadway. A great day. fine weather.